Gardenscapes was one of the most-played games on Facebook. And now with mobile gaming on the rise, New Acres is on its way to become one of the best games on the app store. For the uninitiated, the first game combined hidden object with simulation. Players had to renovate a garden but before that they had to solve hidden object puzzles to rebuild it. The game combines match-3 with gardening sim. In New Acres, you will need to beat match-3 puzzle levels to earn stars. The stars can then be used for rebuilding your dream garden. Everything from cleaning the ground to changing benches to decorating the garden requires stars and many tasks will require more than one star. You will have to make the most of explosives and try every trick in the book to win levels. With the help of these tips and strategies, you will know how to get lives, earn bonus coins and take advantage of power-ups to complete objectives faster, But before that, do check out our gameplay video. 1. Gathering an X number of pieces (apples, leaves, water droplets etc.). 1. Know what type of pieces is needed to complete the objective. Focus on gathering only those pieces and try to take advantage of Rainbow Blast power-up to collect them. 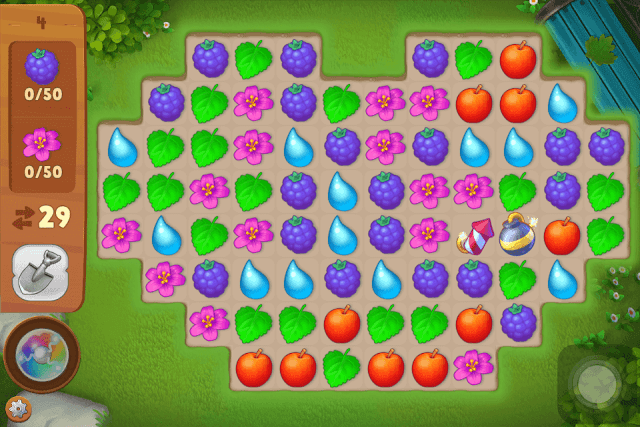 So if the game demands an X number of apples, then try to bring an apple close to the Rainbow Blast power-up and the swap their places to remove all apples on the game board. Create as many Bombs and Dynamite power-ups as possible to trigger bigger explosions. This will remove several pieces on the game board and newer pieces will fall from the top. 2. Gnomes are hidden underneath grassy patches. The grassy patches to be removed first to unearth gnomes. A grassy tile can be removed only when you match pieces around it twice. Here, the use of explosives like firecrackers, dynamites and bombs are crucial to clear the area that hides a gnome. Focus on matches of 4 or more to create as many explosives as possible and then denote them one by one to remove grassy tiles. Do remember that the entire area above a gnome needs to be removed completely to pull it out. 3. To bring lemonade down to the bottom of the game board faster, try to match 3 or more pieces vertically in the same column where the lemonade is placed. Create a firecracker by matching 4 pieces of the same type. Now swap it with any piece to trigger a mini-blast. The firecracker power-up’s cross-shaped blast blows everything within a one-tile radius. You can even detonate the firecracker or any power-up by just double-tapping it. Match 5 pieces to create a Bomb power-up. Now swapping bomb with any piece or double-tapping it will trigger an explosion much bigger than the one produced by detonating a firecracker. It will remove pieces within a 2-tile radius. You can also match pieces in a T- or L-shape to create a Bomb. Matching 6 pieces will give you Dynamite. Double-tap it or swap it with another adjacent piece to detonate and blow pieces within the 3-tile radius. Want to produce a massive explosion that clears almost half of the game board? Why not match 7 or more pieces to create a TNT barrel? Now use this power-up wisely as it can help complete your objectives much faster. So try not to denote when it sits on corners of the game board. Double-tap it when it’s placed in the middle of the game board to remove more pieces. The Rainbow Blast charges each time a power-up explodes. Keep detonating dynamites, firecrackers, bombs and TNT barrels to fully charge it. Once charged, it gets dropped to some random area within the game board. Swap it with a piece and all pieces of that color will be removed from the board. So if you swap it with an apple, then all apples will be removed from the game board. Try and experiment swapping different types of explosives, such as a Bomb with a firecracker or Dynamite with a TNT barrel. Doing this will trigger a bigger explosion and will also charge the Rainbow Blast power-up faster. Levels will be tough to beat and pieces will be randomly arranged on the game board. You will have to play the same level more than once to complete it and may lose lives quickly. In such situations you will need to stockpile of coins so that whenever you are out of lives, you can spend them to get all 5 back. When you fail to complete a level, the game will recommend extra moves for a price of 900 coins. Resist the temptation and play that level again. You will get only 5 extra moves if you accept the offer. Unless the level can be beaten under 5 moves, don’t fall for the bait. 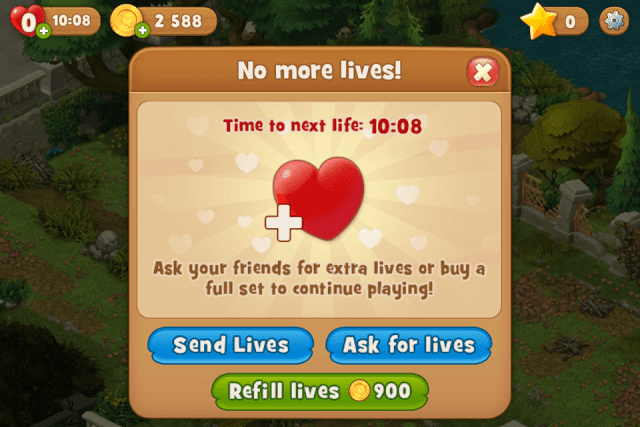 The same 900 coins can be used to get all FIVE lives when you run out of hearts. You will get 50 coins after beating a level. But you can earn extra coins. Try to complete all objectives with a good number of moves remaining at the end of play. All unused moves will be turned into power-ups – bombs, firecrackers etc. and they will automatically explode adding bonus coins to the total coins. All unused power-ups on the game board will also explode, which means more coins for you. Check the mailbox to get rewards. The mailbox will also contain hearts requested from friends. Also, don’t forget to connect to Facebook to get a big bag of coins. Once connected, you can also send lives and request hearts from your FB buddies. Editing an object requires players to tap and hold it until a list of furniture styles is shown. Players can then change the current furniture by choosing a different set altogether. But a switch over to a new set will cost coins and you may have to spend 15-20 coins or more to make the changes. As you progress, you may change your mind and prefer a different bench style or a new fountain, but I would advise not to change too often, unless you have plenty of coins. Save coins for lives. You will unlock boosters as you progress through levels. You will have limited number of boosters of one type, so use them wisely. When the game introduces an unlocked booster, it will force you to use it, but you can choose not to by tapping the unlocked booster to “uncheck” it. A selected booster will have a check mark on it. Just tap it to uncheck it. You may use it later, on a hard-to-beat game board. I’m stuck on level 1316, but when I try to check it online it’s different. I can’t beat this level. You have to get two glasses and I can only get one. I can get it to the bottom but I don’t know how to get it to move to the next section. Can you help? I’ve been stuck on 700 for a week. I’ve used all 3 boosters at once and that did no good. Hardest level so far. Just as the previous poster said, YouTube is of no help because it’s not even the same game. How in the world is level 52 possible? Help me please! I am, I guess, not very good at this. I am on 27. I can’t buy anything because Apple Pay doesn’t recognize my debit card. It just seems I play the very same game over and over. Have no idea how to unlock the 2 rainbow blasts. In level 27, your objective is to collect 40 acorns and 5 gnomes. 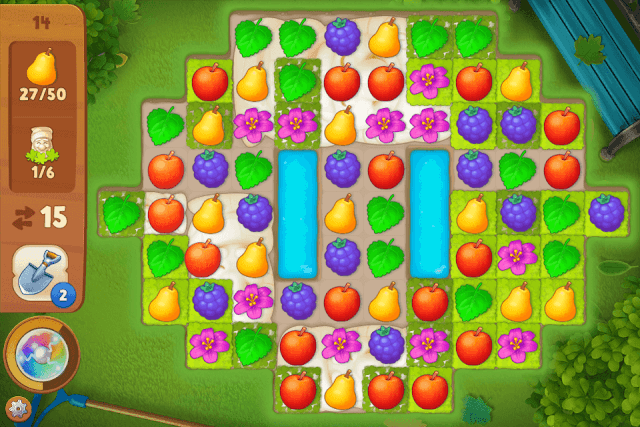 When you begin playing, you will first have to swap places of rainbow blast power-up and the apple to remove all apples on the game board. This will destroy most crates from the board. Just move the rainbow power-up towards the apple to swap their places. You can get a rainbow blast power-up for free if you fill the rainbow bar located on the lower-left corner of the screen. Use power-ups to fill the rainbow bar. You will have to create bombs, rockets etc. on the game board (read the “Types of Power-Ups…” section of our guide to know how to create them) and then double tap them to activate. This will fill the rainbow power-up bar quickly. Matching two power-ups that are placed side-by-side fills the bar quickly. Once full, the rainbow blast appears on a random tile on the game board. You can then use it to clear pieces. Don have the first rainbow blast. Use it. But if you get another one and you have 2 that are far away you can buy the garden glove with coins. It’s expensive but worth it. If they are too far away then use one at a time just save them. You will notice an odd tile on the last row of the game board. This tile is actually a tiny patch of land where pink flowers are grown (I call it “flower tile”). You will have to match 3 or more pieces adjacent to this tile to make flowers bloom. When pink flowers fully bloom, they start appearing on the game board. You can then match 3 or more pink flowers to collect them. The flower tile becomes barren once all flowers bloom and spread out. You will again have to match pieces adjacent to the tile to generate more pink flowers. The first thing you will have to do is break chains on pieces on the last two rows of the game board. The odd tile is on the last row, so you will have to break all chains in order to match objects that are adjacent to it. You can use power-ups or match similar-looking objects with the chained ones to free them. Once all chains are broken, start matching objects next to the flower tile to generate pink flowers and then match pink flowers to collect them. How do you get the butterflies to appear quicker? Hi I am stuck on level 1102. Any suggestions? Thanks! In level 1102, the biggest hurdle is to clear honey. You will have to get rid of those crates first to reach honey, and only then you can clear it. You will need to make power-ups such as bombs to break those wooden crates quickly. You will have to break a wooden crate twice and using bombs is the best way to get rid of them. Honey spreads quickly and to stop it from spreading as well as clear it, you will have to match objects/pieces beside it, i.e. on top, down or right side of the honey spread. In this Gardenscapes level, you must go for big matches to create power-ups and use them to stop honey from spreading. Bombs and crackers will help and swapping two power-ups can clear several pieces at once, helping you unearth those garden gnomes. Keep an eye on those two lawnmowers located on the top of the game board. Check their colors. Now match those pieces that have the same color to fill these lawnmowers. So if the lawnmower’s color is pink, you will have to match pink flowers to fill it faster. Once full, the lawnmower automatically moves down, clearing anything that comes in its way. It can clear a lot of honey. Also, try to fill the rainbow power-up bar quickly, which is located on the lower-left corner of the screen. It can help you clear a lot of objects, which in turn can clear honey and tiles that hide those gnomes. There might be a piece isolated from others, placed next to a honey tile. It can’t be cleared, unless you swap a similar looking piece with the rainbow power-up. So make the most of the rainbow power-up and the bomb power-up to clear pieces faster. Those two lawnmowers can be very helpful in clearing several objects, including honey tiles. I am stuck on level 550. Can’t find a possible way out. If anyone has any tips, please comment below. In level 550, you will have to collect emeralds and pink flowers. While collecting emeralds is easy, as you can create power-ups (a firecracker would suffice) and use them to unearth emeralds from dirt faster, collecting pink flowers can be tough. If you see carefully, you will notice that there are two patches of land in the middle of the game board, just underneath the water canal. You will have to match pieces around these two tiles to make pink flowers grow. You must match pieces next to these two patches of land. When pink flowers bloom completely, they appear on the game board. You can use the rainbow power-up to collect them. Examine the water canal. Pieces floating on the canal move from left to right. But they don’t vanish once they move to the end of the canal. They again reappear on the left side and again resume movement. Should I follow the hints (a piece will move to indicate its the next best move)? You can but you should first examine the game board before following the hint because sometimes, you might spot a much better match than the hint on the board. I am stuck on level 213, this is the hardest game I have really played yet! Will you please give me some tips on how to beat this board! I’m on level 700 but looking for any help seems useless. Any YouTube videos i find aren’t even showing the same level 700 that I’m on. It is beyond frustrating. What i thought would be a fun game is actually infuriating. I think it’s time to delete it. Homescapes is even worse! No longer “fun”. I think it’s because levels are randomly-generated. When you clear few objects, new objects appearing won’t be the same as shown in all game play videos. Yes, there’s an element of luck involved and if you are lucky, and all the right objects appear on the game board then you can clear a level faster.